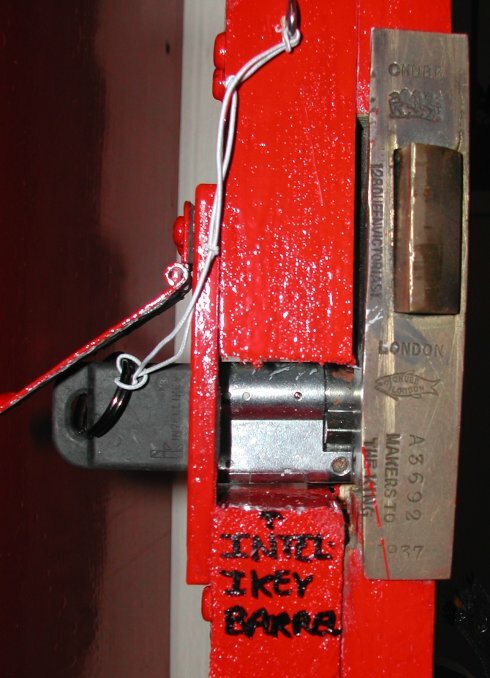 Intellikey was an unsuccessful attempt to computerise the Letter Box. 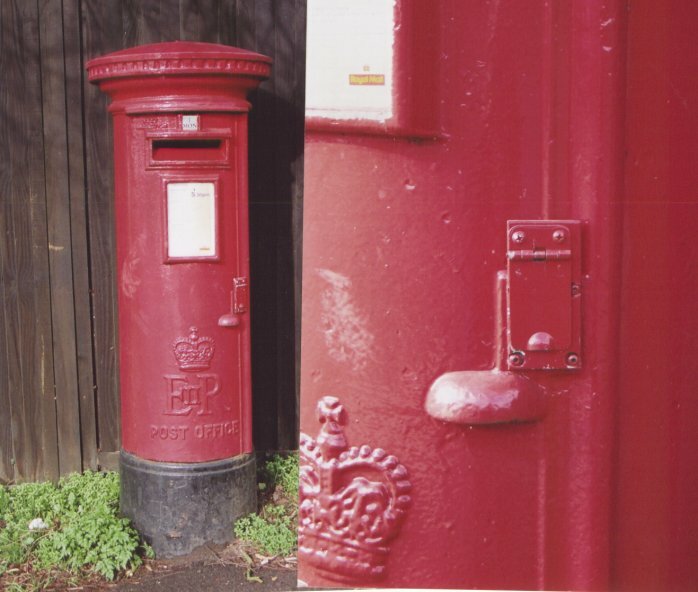 The experiments involved 16 pillar boxes in Central Northampton and a smaller number in Bexhill-on-Sea. The company, Intellikey Europe Ltd, was set up to market the US-made Intellikey system. It works by using electronics to control the opening of the lock. Each box is modified to accept a lock barrel known as an Intelligent Profile Cylinder. These barrels accept the key physically, but will only allow it to rotate if the electronics recognise the key and match certain other factors. 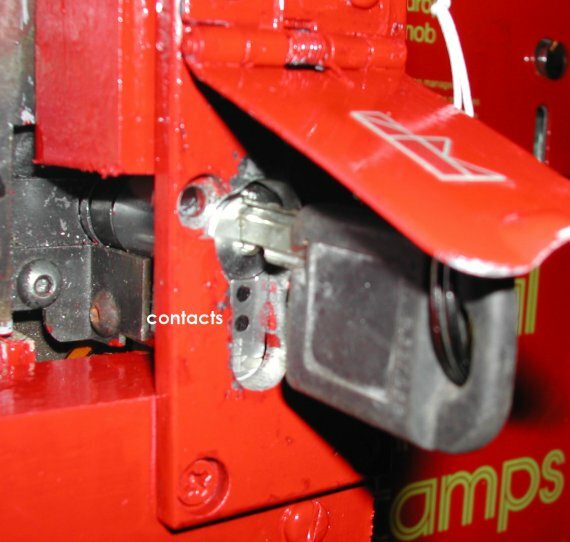 In the case of Royal Mail, the Intellikeys were set to only open the lock / box if the key was inserted at the correct time for emptying the box, plus or minus 5 minutes. The figure below shows a side view of the barrel in situ and the key in the lock as viewed from the edge of the door. This is possible because each key is encoded with a binary digital number that can be read through the cylinder via two small contacts on the key which touch two similar contacts on the cylinder. If the key is inserted at the correct time, the box will open, but if the Postman arrives late, it will not. It also records this fact in memory. the picture at right shows these contacts on the barrel, a matching pair are on the key itself. Fitted to the inside of the box is a large aluminium cast box containing the CPU and interface plus a large Lithium battery. Of course the batteries had to be regularly changed. To prevent the CPU forgetting the collection times during battery change, a second smaller lithium battery was installed. However, if they both failed or contact was lost, the CPU lost its settings and failed safe; in other words failed locked. The box then had to be drilled open. Collection times could be programmed in the field using a laptop computer with a special cable that connects to the box CPU. A special screwdriver is needed to open the CPU and reveal the connector and to change batteries, not a good idea when it is raining. You can see the CPU unit and a modified 1937 lock in the pictures above.. If a postman was caught in heavy traffic, he could not clear the box either and it would not re-open until the next due collection, often next day. The contacts were severely affected by rain and damp and for this reason the aluminium flap you can see here in the first and last pictures was rapidly fitted to the boxes as an afterthought. It still failed to keep the damp out. 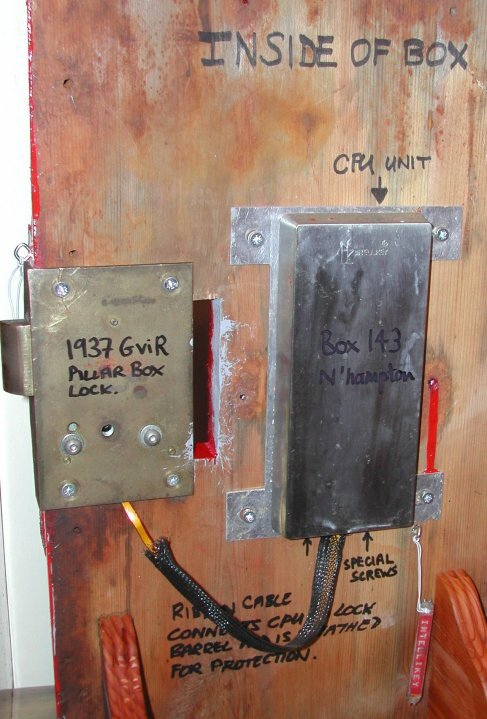 The enormous cost and inconvenience of maintaining these boxes led to a quick end to the experiment and the equipment was quietly removed and stored, but not before 16 locks had been hopelessly butchered at a cost of £85 each. Only two complete sets have survived and neither of these will ever work as they have lost their programming. The mock-up here uses an old Ludlow-style door, but in fact the only boxes to sport Intelikeys were all pillars in the busy centre of Northampton, including some C types, hence this left-hand lock. This rare picture shows the system in use on a PB38/1 situated at The Avenue, Kettering Rd, Northampton and was taken on 2nd March 1997. This was after the spring-loaded rain flaps were added. The box is still there but with a normal lock.